- Publisher Carl Trueman is Lecturer in Historical Theology at the University of Nottingham. 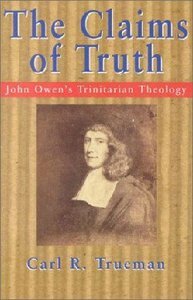 About "The Claims of Truth: John Owen's Trinitarian Theology"
Carl Trueman is Lecturer in Historical Theology at the University of Nottingham. Carl R. Trueman (Ph.D., University of Aberdeen) is Professor of Historical Theology and Church History at Westminster Theological Seminary. He is the author of Luthers Legacy: Salvation and English Reformers, 15251556; The Claims of Truth: John Owens Trinitarian Theology; Reformation: Yesterday, Today, Tomorrow; The Wages of Spin: Critical Writings on Historic and Contemporary Evangelicalism; John Owen: Reformed Catholic, Renaissance Man; and Minority Report: Unpopular Essays on Everything from Ancient Christianity to Zen Calvinism. He is also the editor of Themelios and has contributed to the Dictionary of Historical Theology; the Dictionary of National Biography; The Cambridge Companion to Reformation Theology, and the Blackwell Companion to Modern Theology.